The sun is like a giant electromagnet! In this activity students will explore how the sun’s electromagnetic properties interact with Earth’s magnetic sphere, including the effects of solar storms when they hit the Earth. Collect and alalyze data to determine the factors that affect the strength of electric and magnetic forces. You may want to do this activity after doing the GBO Build an Electromagnet! activity. Split your classroom into small groups for this activity. Decide whether you will have your students create the model in groups, or you will prepare the models ahead of time. We suggest you watch the “Magnetic Connection” video ahead of time which details the demonstration and the activity. Do not show this to your students. Find the video on the video tab. Before doing this activity introduce your students to the Earth and Sun’s magnetic fields through the videos in the video tab, and/or the slideshow on the Powerpoint tab. The sun has electromagnetic properties. Electrons moving around in the Sun cause electric currents, which in turn create a magnetic field around the Sun. The areas of intense magnetic activity on the Sun are where intense solar activity occurs, caused when magnetic field lines get twisted together. After magnetic field lines get tangled enough and a large amount of energy builds up, they can violently unwind and cause an eruption, called a solar flare. This burst of electrons can affect Earth’s technological, communication, and navigation systems. Scientists study solar flares to gain scientific knowledge and to make predictions that will help protect our technological systems on Earth. Remove unnecessary items from the pizza boxes and keep all magnets a couple of feet away from the compasses. Make sure that the tables you will be using don’t have metal supports directly under the experiment which will interfere with the magnets and compasses. You can choose to do this with your students or beforehand. Start by adhering the soft side of the 5 Velcro strips to the pizza box. There should be one in each corner about 2 inches from the sides, and one in the center (see picture below). Adhere the hook sides of 4 of 5 Velcro strips to 4 compasses. Adhere the last hook side of the Velcro strip to the rod magnet and set this off to the side- about 6 inches away from the box to not interfere with the compasses. Now attach the 4 compasses to the corners of the box. Make a “Solar Storm” arc. Glue the small magnets to the bottom of the plastic arcs. Set off to the side to not interfere with the compasses. Write “Solar Storm” on all plastic arcs. Now you have the objects you need to do the activity. Follow the directions below if a compass gets demagnetized and you need to realign it. Select a compass that is working correctly. Determine the north end of the rod magnet by holding it against the working side of a compass. The north end of the magnet will attract the north arrow of the compass that is working correctly. Select the non-working compass and place the north end of the magnet against the south mark on the compass. Slide it across the top of the compass towards the north compass mark. Your compass will now be realigned to face magnetic North. Have student groups look at the 4 compasses in their model and fill out the Lab sheet answering the question why the compasses are pointing North (if any of the student’s compasses are not pointing North, realign them through the procedure above). Have students experiment with removing different compasses with the bar rod on and off the box. What do they notice happening? Have students attach the magnetic rod to the center Velcro. Now have them answer the second and third questions on the Lab sheet. Remind students about how the Earth’s magnetic field is different than the sun’s magnetic field. The sun has many loops of magnetic activity that get tangled and can generate solar storms, a huge burst of energy that blows into space and can be directed in Earth’s direction. Have students imagine a solar storm has erupted in the direction of Earth. Have them take out the rod magnet and place to the side. Let them know that it takes 2-3 days for the burst of positive and negatively charged ions from the solar storm to reach Earth. Now they will be the solar storm, passing the arc over the 4 compasses. What happens to the compasses as you pass the Solar Storm arc above them? Have students finish the remaining questions of the Lab Sheet. Slide 2: Like the Earth, the Sun has roughly the same pole-to-pole field, but below the surface, the magnetic field lines are tangled and irregular. Elections moving around in the Sun cause electric currents, just like the electrons that flow through wires. Slide 3: This is an image of the Sun taken by the Solar Dynamics Observatory. It is called a magnetogram. 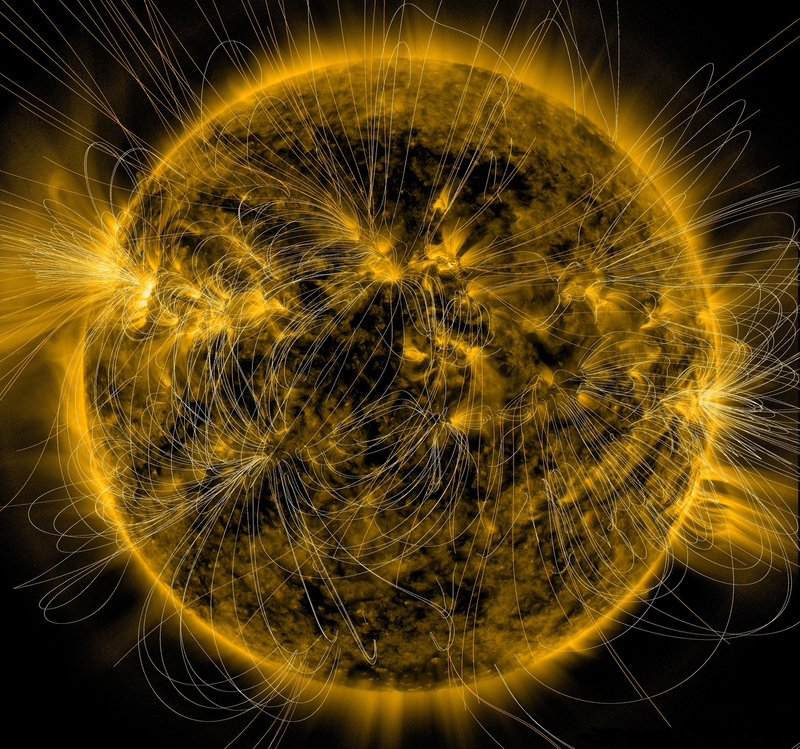 It is a map of magnetic activity on the Sun. The black and white areas indicate there is a high level of magnetic activity, and the gray areas indicate there is no magnetic activity. The white lines represent the complex magnetic field lines around the Sun. Slide 4: When magnetic field lines get twisted and tangeled together, they can build up a large amount of energy. This energy then can viontley unwind and cause an eruption. When these eruptions move away from the Sun into space, they are called solar storms. Slide 5: When solar storms head in Earth’s direction the high electric current effects technology here on Earth. The abundant amount of energy can cause problems with our technological, communication and navigation systems. This is a great video for the teacher to watch before doing this activity with your class. Don't show it to your students! A great short introduction on solar magnetism for your students.